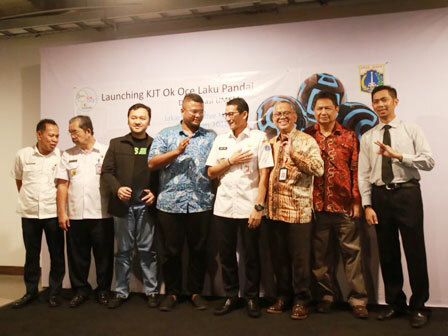 Jakarta Vice Governor, Sandiaga Uno launched Komunitas Jakarta Tersenyum (KJT) OK OCE Laku Pandai at Jakarta Creative Hub, Kebon Melati Urban Village, Tanah Abang, Central Jakarta.
" Our target is to have 500 grocery traders to join this community by mid of this year"
This program helps traders to be able doing banking transaction. Small traders can gain profit through transaction fee and expand their network through banking transaction and Payment Point Online Bank (PPOB). Jakarta Vice Governor, Sandiaga Uno mentioned, KJT OK OCE Laku Pandai is an effort to uplift small traders, especially grocery traders to use financial technology (fintech) and financial inclusion. "Entering fintech era, small traders, especially grocery traders supposed to be upgraded. This breakthrough needs to be appreciated," he expressed, Wednesday (2/7). According to him, this program is very simple, user-friendly, and intuitive. In the future, grocery traders can facilitate customer to do various transactions such as cash deposit, cash withdrawal, and funds transfer. Also PPOB, donate for government social assistance for Keluarga Sejahtera card holder, and others. "Grocery traders can have a part in inclusive and fair financial ecosystem," he added. He informed, at least 40 grocery traders in five regions already joined in KJT OK OCE Laku Pandai. "Our target is to have 500 grocery traders to join this community by mid of this year," he affirmed. Meanwhile, Financial Services Authority (OJK) Regional 1 for Jakarta and Banten Head, Bambang Widjanarko appreciates Jakarta Provincial Government, community, business, and financial institutions who have implemented KJT OK OCE Laku Pandai. "We hope this program could contribute for community welfare. I hope Jakarta Government could continue OK OCE programs and financial inclusion in the future," he conveyed.